This beautiful drive skims the coastline and passes through a number of small fishing towns. Almost every town, particularly Castine, Brooklin, Blue Hill, and Ellsworth, is worth a stop to stroll the streets and enjoy local architecture, arts, and restaurants. Blue Hill Peninsula. Peninsula towns are Blue Hill, Brooklin, Brooksville, Castine, Penobscot and Sedgwick. Blue Hill is the gateway to Deer Isle and Stonington, a landscape of blueberry barrens and the sea. Entertainments range from a day on the water to live music, gallery tours, and shopping. 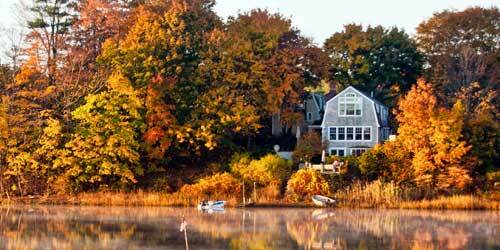 Seal Harbor is a secluded harbor with a 19th-century rural village, shoreline, and wildlife viewing opportunities. Two great places to explore here are Long Pond and Stanley Brook. Thunder Hole is a chasm into which ocean waves crash with great booms and splashes. On the southwest corner of the Park Loop Road, about four miles south of Bar Harbor. People have been drawn to the rugged beauty of coastal Maine throughout history. The 27-mile Park Loop Road is the best way to get an overview of Acadia National Park. The road takes you past highlights like Otter Cliffs, Thunder Hole, and Sand Beach. There are many pull-off areas to stop and enjoy the view. The loop road begins near the Hulls Cove Visitor Center on the north side of the island. See below for more access points. Much of the road is one way but there is a two way section that begins near Wildwood Stables. A fee is required and may be paid at the Entrance Station located about one-half mile north of Sand Beach. Entrance Passes may also be purchased at the Visitor Center, Blackwoods and Seawall Campgrounds, the Bar Harbor Village Green, and the Thompson Island Information Center. Whale-watch cruises from Bar Harbor. 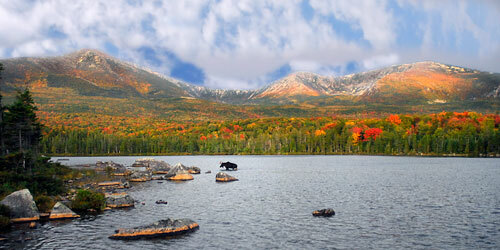 Travelers will wind through the mountains and lakes of western Maine. Step back in time and treat yourself to spectacular scenery, outstanding recreational opportunities, abundant wildlife, local museums, and quaint New England villages. Slow down, relax, and enjoy nature’s abundance at every turn. This drive follows Routes 17 and 4, wrapping around Rangeley Lake. 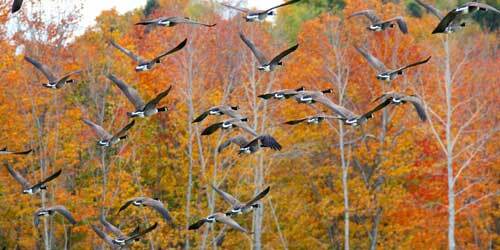 It follows the ridgeline of the Appalachian Mountains before dropping into rolling hills and valleys. The Height of Land on Route 17 is the centerpiece of this scenic drive, offering breathtaking views of Mooselookmeguntic and Upper Richardson Lakes. Allow 2.5 hours to drive and eight or more hours to visit this byway. At Height Of Land you can see hundreds of miles of lakes, mountains and forests. You can also see the White Mountain chain in neighboring New Hampshire. 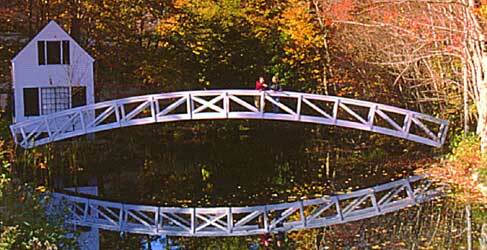 Height of Land is often considered to be the most spectacular overlook in northern New England. The Maine Forestry Museum, Rangeley. 207-864-3939. This museum displays equipment, artifacts, photos, and historic tape recordings of people in the logging profession. Leaving Oquossoc, take Route 16 east for about 10 miles. 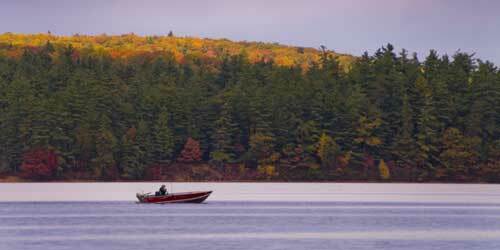 Begin your drive in Farmington, the entryway to Maine’s ski country. This route will take you past some of the major ski resort areas, whose mountains should be aflame in fall colors. Mount Blue State Park, off Route 156, Weld. 207- 585-2261. 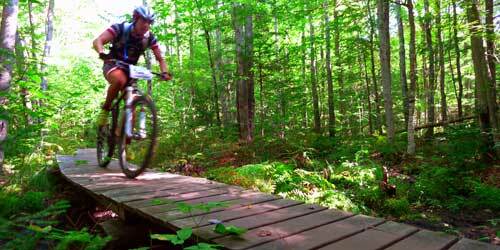 This park is open year-round for hiking, trail riding, biking, swimming and picnicking; snowmobiling, cross-country skiing, snowshoeing, and ice skating. Rangeley Lake State Park, Rangeley. 207-624-6080. Open May 1 to October 1. This trip will take visitors through the Southern corner of Maine, known for its historic sites and apple orchards. Cornish Trading Company in Cornish. This 19th-century Masonic building is filled with antiques: country and decorative furniture and accessories, garden and architectural elements; folk art, textiles, jewelry, furnishings for camp and cottage. Open April through November. 207-625-8387. Limerick is a delightful small town of good dining and antique shopping, Visit Greenwood Herbals in Limerick is a healing and teaching center, natural apothecary, labyrinth and gardens. Come to learn about plant medicine, history and harvesting from nature and to shop for medicinal teas, extracts, dry herbs, salves, oils, and creams. 207-793-3553. The town of Fryeburg is known for its huge fall country fair. It has 11 buildings listed on the National Register of Historic Places and 12 public parks. Visitors love to canoe or kayak on the Saco River or walk the short hike up Jockey Cap Trail to see views of dozens of distant peaks. Scottish & Irish Merchant, Bethel. 877-607-7787. Steam Mill Antiques in Bethel is a country antique shop located in a large, 1820 farmhouse and barn. The property alone is fun to visit. Dining: The Oxford House Inn in Fryeburg offers a charming break for the stomach and the senses during your tour of the region, its gourmet restaurant, and a granite-walled pub offer sunset mountain views and exceptional food directed by the owner and chef, trained at the Culinary Institute of America. 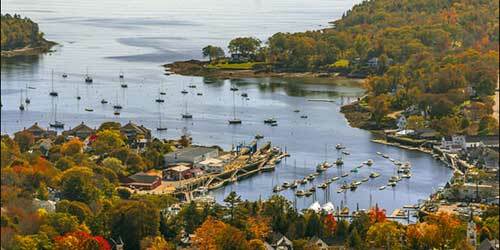 This trip passes along scenic shoreline, through quaint fishing villages, and to the top of Mount Battie and through the postcard-perfect village of Rockport and Camden. Pemaquid Point and Lighthouse, Bristol. 207-677-3266. Try not to miss a visit to this wonderfully beautiful place. The lighthouse overlooks a shield of flat rocks leading to the water. Stunning. Gift shop, too. State of Maine Cheese Company/Maine Made Products Center, 461 Commercial Street / Route 1, Rockport. 800-762-8895. Beginning in Augusta, Maine’s capital, this trip winds through the Winthrop Lakes region and the Belgrade Lakes region of the state, where outdoor and wild natural beauty is on display among many busy small towns. Augusta. The state capital and gateway to the region, Augusta has an impressive State House (1829) with a 180-foot dome, designed by architect Charles Bullfinch. 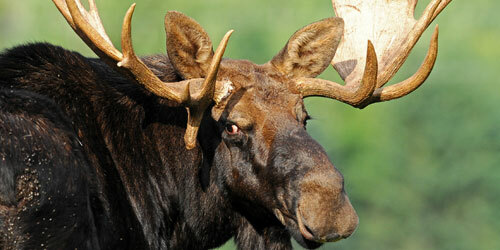 The Maine State Museum describes 12,000 years of Maine life through exhibits and 2,000 artifacts. A nice farmers market operated on Tuesdays, May through November. This trip takes travelers north from Skowhegan up toward Jackman, and down past Moosehead Lake. On the way, you will pass Moosehead Lake, Moxie Falls and Mount Kineo. Particularly scenic segments of the trip are Route 201 between Solon and West Forks, and Route 6 and 15 between Jackman and Rockwood. This scenic trip features long stretches of unpopulated territory between towns. The route begins north of Bangor and ventures into the region known for growing Maine potatoes. Bangor – Hollywood Slots at Bangor, 500 Main Street, 877-779-7771. Slot machines, silmulcast racing, dining, entertainment. Houlton, Duty Free Americas, 4 Airport Road and 1-95, 207-532-6540. Discounted consumer goods of all kinds: liquor, watches, and more.